Former education secretary Nicky Morgan has warned pro-Brexit Tories against “sabre-rattling” over the UK’s future customs arrangements with the EU. She said speculation that Theresa May could face a challenge if MPs ended up backing some form of post-Brexit customs union was “deeply unhelpful”. MPs are to debate a backbench motion on Thursday calling for the UK to retain this type of arrangement after Brexit. Labour says a union of sorts is the way forward but ministers reject this. Downing Street’s position is that staying within the EU customs union or joining some new form of union would restrict the UK’s ability to strike trade deals with other countries and therefore be unacceptable. The government is instead looking at two options after the UK leaves on 29 March 2019 – a new customs partnership with the EU – under which there would continue to be no customs border between the EU and UK – or a “highly streamlined customs arrangement” using technology to facilitate the movement of goods. Labour, the Lib Dems and the SNP, plus some Conservatives, believe that only a fully-fledged union will protect existing trade. They say it is also the only viable way to avoid a hard border on the island of Ireland. Thursday’s backbench debate was tabled by senior cross-party MPs, including Ms Morgan, after ministers lost a vote on the issue in the Lords last week. 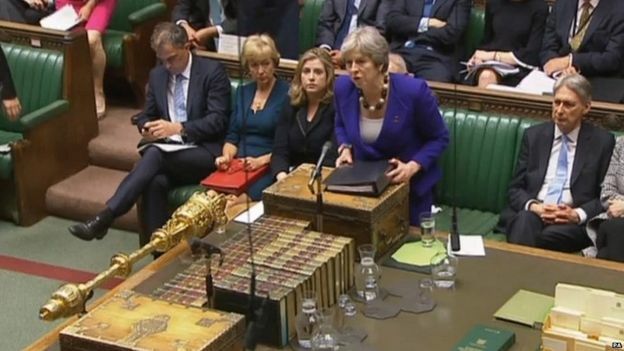 Although the vote will not be binding, it has raised temperatures in the Conservative Party and led to unconfirmed reports that top ministers might quit if the government has to concede defeat on the issue at some point in the future. Speaking on the BBC’s Sunday Politics, Mrs Morgan, the Treasury committee chair who is one of the most pro-EU voices in the party, said the PM’s stated objective was to have frictionless trade and MPs should be able to “tease out” the best way to achieve this in a “calm and rational” way. “If every time Parliament debates this issue or passes an amendment all we end up with is a sort of hysteria and leadership speculation, that is really not in Britain’s interests,” she said. Although some MPs have questioned the point of Thursday’s debate, Mrs Morgan said the views of businesses and constituents worried about the impact of Brexit on their livelihoods ought to be discussed in Parliament. But Chief Secretary to the Treasury Liz Truss told Radio 5 Live’s Pienaar’s Politics it was very important that Parliament didn’t seek to “bind the prime minister’s hands” when it came to negotiations on a future customs framework. “It’s already a negotiation that has a lot of complex aspects to it,” she said. And Justice Secretary David Gauke said the government had to make and win the case that leaving the EU customs union would not result in “unnecessary barriers”. For Labour, shadow foreign secretary Emily Thornberry told the BBC’s Andrew Marr show the opposition was committed to leaving the EU but doing so in a “pragmatic” way which did not puts jobs at risk. No 10 sources told the Press Association policy had not changed and the UK was leaving the customs union.